Go Anywhere, Do Anything! With this protective, durable, water resistant, tough addition to your wheelchair! What is the GADA Belt? Named after our company’s motto Go Anywhere, Do Anything™, The GADA Belt is a soft, secure, waterproof side guard set/clothing protector for manual wheelchairs that is also used as a sports belt, and is great for maintaining proper seating posture. 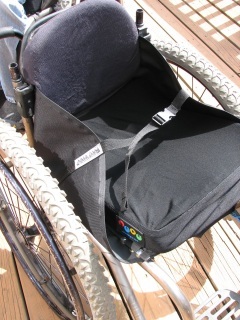 This multi-functional device was designed to replace the hard-plastic side guards that typically come with manual chairs (and can cost as much as $300) and gets rid of the need for separate, single-strap lap belts often used by wheelchair athletes in sports such as tennis, basketball, and rugby. The GADA Belt’s soft canvas design reduces skin damage and breakdown, and actually improves the handling and performance of your chair while playing sports and recreating outdoors. This product is currently designed to fit all most manual wheelchairs with hard slings (specifically Quickie and Ti) and design modifications for soft sling chairs and other models such as Invacare, Lasher Sport, Colours, Kushcall, and Flight Ultralight are underway and GADA belts will be available for these brands soon in addition to other sizes of the belt for larger and smaller users such as children. For active wheelchair users and business men and women that need to look professional, the GADA Belt keeps clothing clean & dry, and is a great way to keep business jackets neatly tucked in. For people with hip and/or pelvic alignment issues, the GADA Belt has been recommended by physical therapists to help correct and ensure good posture and alignment as well! Released at the 2008 Abilities Expo in Anaheim, CA, the GADA Belt received a warm welcome from individuals and wheelchair companies alike, and is good for all chairs - sports chairs, Quickie, Ti, etc. 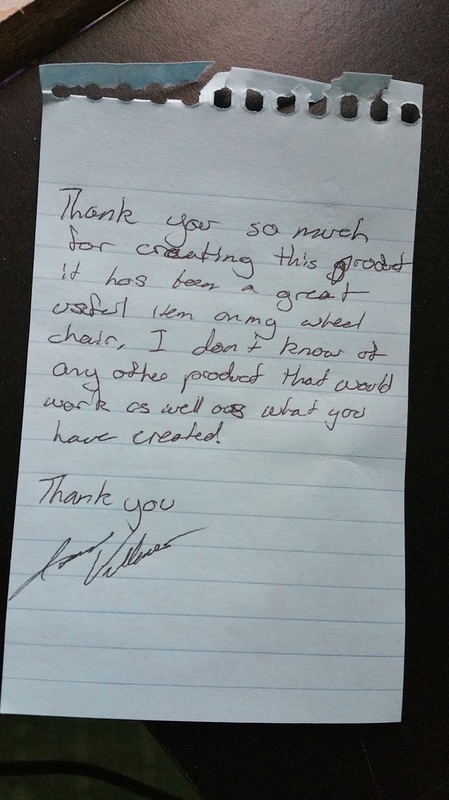 Because this products design varies slightly per chair design, please call or email us before purchasing to make sure it is applicable to your chair type. Once you have confirmed this, please purchase online.